Will Jon Blow ruin gaming? Comments Off on Will Jon Blow ruin gaming? Here’s an interesting profile of Jonathan Blow, about his last game Braid and his next game The Witness, and how he thinks games are stupid and he’s going to turn them into art. Now, I’ll say right off that The Witness looks intriguing, and a welcome change from shooters, and I’m anxious to try it. Now, I kind of agree with him that most games are dumb, and aspire to be nothing more than an interactive action movie. But, I’m apparently the one person in the world who hated Braid, so I’m not sure he’s on the right track. I don’t care for the arty bits of Braid one way or the other, because I never saw anything arty. It failed for me as gameplay. It’s apparently a load of art layered on top of a platformer, and to like it you have to a) like or at least be nostalgic for platformers, and b) be good at platformers. But by historical accident, I never played many platformers (when you youngsters were playing Nintendo, I was messing around with Macs). I don’t like games that require twitchy skills, or puzzle games, unless they’re very rewarding in some other ways… this usually requires immersive 3-d environments (as in Portal or Mirror’s Edge). As I couldn’t get into the gameplay, I gave up on it and so I missed all the Art. 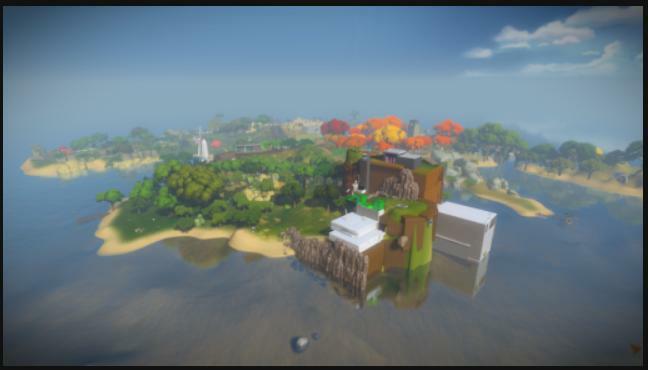 So, apparently you’re going to wander around a very pretty island in The Witness, looking at stuff and solving puzzles; it’s apparently going to be Myst made arty. (Wasn’t Myst already arty?) According to the article, a big part of the game will be listening to audiotapes from the guy who made the puzzles. Blow sounds very bright and earnest, but this makes me think he’s unclear on the concept of video games. If the heart of the game is narratives, no matter how poetic or reflective or soul-searing they turn out to be– well, that’s not a game, that’s a novel read out loud. Voiceovers can add a lot of depth to a game, but they can’t be the game. Whether the game is actually fun– or finishable– depends not on how good he can make the voiceovers, but on how compelling he can make the puzzles. Apparently Tom Bissell worked on the game a bit, which is ironic, because Bissell does get it. He’s actually very good at pointing out the strange dance between player and game designer, and the fact that the most compelling game experiences are a collaboration between the two. I liked his story of betrayal and heroism in Left 4 Dead— a story with as much depth as you could want, and which wasn’t told by Valve. It emerged out of the gameplay. I’ve noted before that in the most satisfying games, there’s a congruence between what the game is about– what the game designer thinks it is– and what you actually spend most of your time doing. Mirror’s Edge is my go-to example: it’s about moving from point A to point B, something that’s normally incidental in a game. They did their best to make it interesting, varied, and challenging, and you spend most of your time on that (the story is minimal, and the combat is just an obstacle to more running). From the description, Blow thinks games should be about something else– some thematic revelation– and the gameplay is… I don’t know, something to amuse you while you’re pondering. He doesn’t seem to get that that there’s anything the player brings to the table; he seems to think of players as an audience. Maybe he should make movies instead.